New evidence beamed back by the Curiosity rover and analyzed by NASA JPL scientists suggests that the Gale Crater on Mars had large lakes, rivers and deltas for millions or tens of millions of years. The implications are huge, since if Mars ever had a chance of fostering life, it needed to not only have flowing water and organic molecules at its disposal – but have them for a long, long time. Climate models, however, suggest that the ancient Martian atmosphere couldn’t have supported surface water in liquid state for more than a couple tens of thousands of years at a time. These most recent findings contradict the estimates. 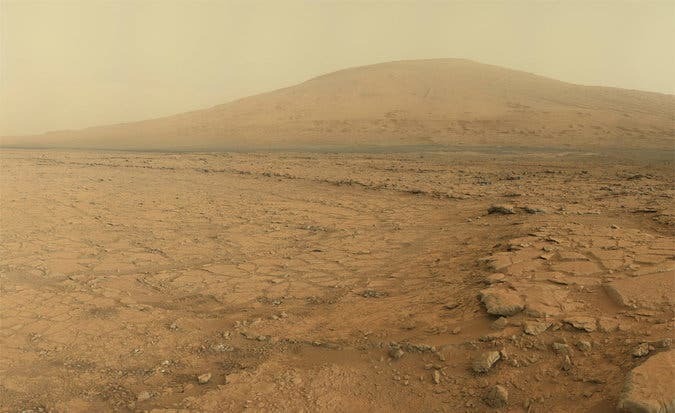 The Curiosity rover landed in 2012 on Mars 5 km away from the Gale Crater, a great place to start exploring the Red Planet because of the mountain of layered materials in the middle that’s 5 km high! 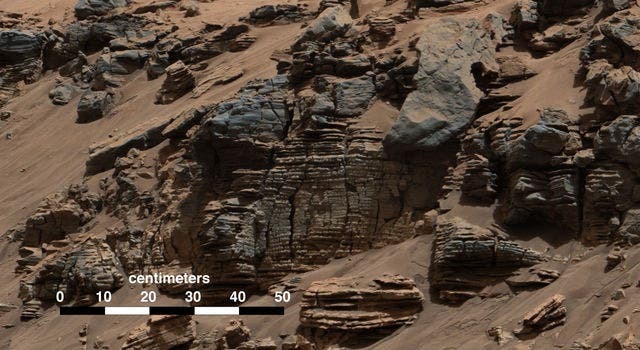 These layers hold telltale signs of how Mars was like in the past, revealing how the planet’s climate and geology changed throughout most of its history. Satellite imagery from orbit shows that these layers are made up of different minerals. For instance, the bottom of the mound is mostly made of clay minerals, while above sulfur and oxygen-bearing minerals stand. Both the mound and crater walls are carved up by what can only be flowing water, but for how long did this last? This is a highly important question to answer. If Curiosity’s interpretations are right, then Mars may have had a climate that could have supported long-lasting lakes at many locations on the Red Planet. 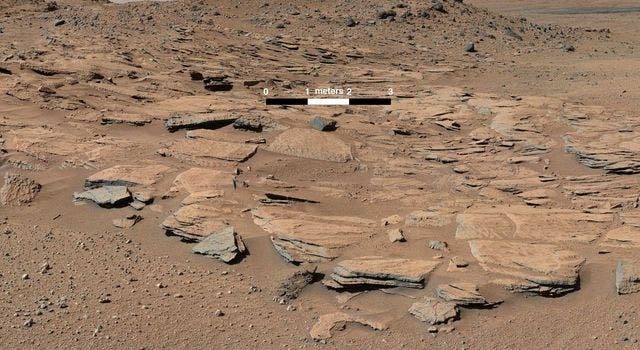 The rock layers studied by the rover alternate between lake, river and wind deposits bear witness to repeating filling and evaporation patterns of a Martian lake much larger and longer-lasting than anything examined thus far. Curiosity’s focus is on the lowest sedimentary layers of Mount Sharp, a section of rock 500 feet (150 meters) high, dubbed the Murray formation. 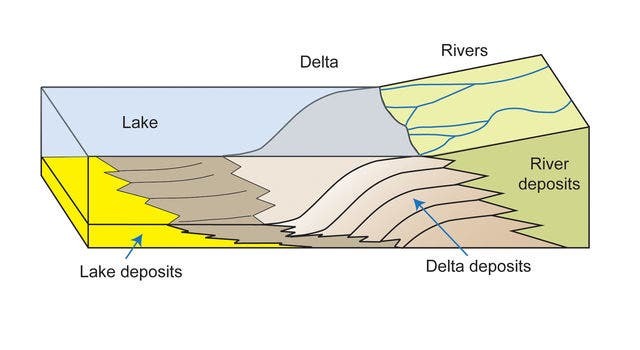 There, the rover found trace evidence of how ancient rivers carried sand and silt to the lake, depositing the sediments at the mouth of the river to form deltas similar to those found at river mouths on Earth. As the rover made its way from the landing site to its current work site at the base of Mount Sharp, the rover uncovered clues about the changing shape of the crater floor during the era of lakes. This conclusion is difficult to square with the current climate models that point toward an ancient Mars that was too cold and had a much too thin atmosphere to support liquid water for such long periods of time. There are several hypotheses that try to explain the discrepancy, since the models aren’t necessarily wrong. One would be that frequent volcanic activity and meteor impacts may have raised global temperatures just enough above the freezing point of water. Another explanation would be that a substantial ocean located in the planet’s northern half may have filled and molded the vast depression, but since no shorelines were observed this latter theory stands on thin ice. What ever’s the case, we now have a growing body of evidence that proves without reason of a doubt that Mars hosted vast quantities of flowing water. Another major indication of Mars’ wet past are floor polygons that suggest bodies of water at least half a kilometer deep were present on Mars. Concerning life on Mars, however, things are a bit more complex. How life first appeared in still a mystery, but from what scientists can gather these absolute basic conditions need to be met: liquid water, organic compounds based on five essential elements ( carbon, oxygen, hydrogen, phosphorus and nitrogen) and, equally important, lots of time.